Webster leaders were featured in Gazelle discussing the annual diversity and inclusion conference. 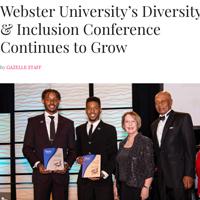 Webster University President Elizabeth (Beth) J. Stroble and Chief Diversity Officer Vincent C. Flewellen were interveiwed in Gazelle magazine discussing Webster's diversity and inclusion efforts and this spring's annual conference. Read the full story in Gazelle. The next annual diversity and inclusion conference takes place Feb. 26-28 at the main campus in Webster Groves. Webster chess team head coach Susan Polgar was interviewed by Fox 2 while two chess team members played live on air after Webster's seventh consecutive Pan-Am Championship. “It was a tough fight as always, and came down to the last match," Polgar said. "We’re very proud of our students as they battled, did their best, and it worked out again.” She also helped educate viewers on the etiquette for watching live chess as a spectator. 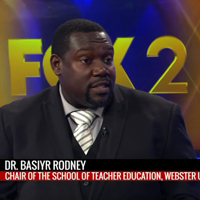 Basiyr Rodney was interviewed on KMOX 1120 AM radio and on Fox 2 News about school districts that have moved to a four-day week. Warren County, about 60 miles west of St. Louis, is the latest Missouri district to vote for the change in hopes of retaining teachers and saving money. Media asked Rodney, associate professor and department chair of Teacher Education in Webster's School of Education, about the theory and potential impact of such moves. Watch the full Fox2 interview here. His KMOX interview aired on the radio during Monday evening and Tuesday morning commute times.